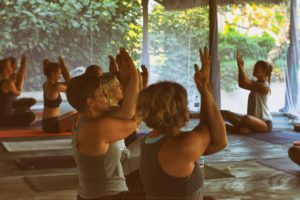 Teaching yoga is all about being of service, and if you’ve been practicing yoga for a while, you may have heard about the concept of seva – selfless service. In practicing seva, you are devoting yourself to others, helping those around you. If you’re asking yourself if you can really make a difference, the only answer is yes. Yes, I can help. Yes, I will do this. Yes, this is possible. It’s no need for your efforts be global. It’s virtually impossible to change the world in one fell swoop, so start local. Focus on the community around you, the partnerships you’ve created, and the lives of those you’re able to touch. If you are not sure where to start, try looking within to see what life experiences and gifts you can bring to the table. Often our own personal wounds and challenges is our greatest gifts to share, for where we have been hurt, we also become more understanding and open, but if you find it hard to share your personal story, seva can also be as easy as paying the toll for the person behind you or shooting off a nice email to someone you haven’t spoken to in a while. Regardless of what you choose to do, the most important contribution you can make is to show up every day from a place of compassion and love. Choose to use your life’s energy to make the path easier for others, and peace, happiness and goodwill for all isn’t just possible – it’s inevitable. I have the greatest passion for teaching, and I would love to be a part of your journey and help you grow and heal through yoga and energy medicine. If you happen to be in beautiful Oslo, be sure to drop by my little gem of a yoga studio Leela Yoga or come practice with me when I teach around the world! HERE ARE MY STYLES – CHOOSE YOURS! This is a yoga class for those who are new to yoga, or for those who want to deepen their practice, work on their alignment and get a more in-depth understanding of the poses. Yoga Basic are also perfect for those who suffer from an injury, illness, or other limitations, to learn gentle modifications and/or alternative poses, as well as building the necessary strength and flexibility to heal. Vinyasa is a type of yoga that links movement and breath to attain balance in the mind and body. From the Sanskrit “to place in a special way,” vinyasa aligns a deliberate sequence of poses with the breath to achieve a continuous flow. Inhalation is usually connected to upward, open movements, while exhalation is often tied to downward movements or twists (Yogapedia). All Vinyasa Flows can be tailored to your level! A playful, flow working through the whole body. A vinyasa flow class challenging your strength, alignment, balance and coordination. A playful Vinyasa Flow with focus on building your core strength and proper bandha engagement throughout your practice. New to the bandhas or “energy locks” of the body? Check out Mind Body Greens beginners guide to the Bandhas here. A Vinyasa Flow focusing on the heart opening poses (back-bends and shoulder openers) helping you to connect to your heart center and heart chakra, encouraging you to open up, let go and practice forgiveness. Vinyasa Flow that works specifically into your hip area,. The hips are known to be the body’s junk drawer, and a place where we store some of our deepest vulnerabilities. Through a hip opening flow you will work on releasing your tensions and stored emotions in a gentle way. Read more about how we carry our emotional baggage in our pelvis here. A slower paced vinyasa flow, specifically working on the lower chakras and getting you out of your head and into your body, helping you to release the stress of everyday life. A slower paced vinyasa flow, combining a soft and gentle flow with the longer gold of yin yoga poses (see Yin Yoga below). Combine your preferred method of yoga with astrology, and tailor your sequence to the natural rhythms of the sun and moon. Learn more about yourself and your sun sign, connecting astrology to the divinity that is your body. Tailor your practice to the energies of the season or find the perfect yoga sequence for your sign. Yoga for the chakras includes an Energy Medicine consultation to locate which chakras are imbalanced for your yoga practice to be tailored to your specific needs. The 60 min yoga sequence will be fitted to your level and can be slower (Slow Flow/Yin) or more vigorous (Vinyasa Style) depending on what your body needs. Each session will be finished with a Chakra Balancing. Yin Yoga is the art of letting go. Through a soft and introspective focus, the longer held yin poses typically 3 – 5 minutes) brings a newfound awareness into your body, helping you to become more conscious and present with what is. The long holds in the poses gives your body the time it needs to release the fascia and work deeper into the connective tissue, removing blockages for your energy to flow more freely through your body. Yoga Nidra is considered the art of conscious relaxation, and through guided relaxation/meditation your mind and body is brought into the healing state that exists in between awaken and asleep. “In yoga nidra, we restore our body, senses, and mind to their natural function and awaken a seventh sense that allows us to feel no separation, that only sees wholeness, tranquility, and well-being” – Richard Miller. It is said that 30 min Yoga Nidra equals 4 hours of sleep! Many people think that they need to be flexible to begin yoga, but that’s a little bit like thinking that you need to be able to play tennis in order to take tennis lessons. Come as you are and you will find that yoga practice will help you become both flexible and strong. But better agility is not the only perk of a regular practice. Science has proven that yoga can have a transformative effect on the body, resulting in everything from lowered blood pressure to disease prevention (Jen Reviews). Click here to read 18 amazing health benefits of yoga, as proven by science.